The Maryland Department Of Transportation State Highway Administration (MDOT SHA) Adopt-A-Highway Program lets community groups show their state pride and keep the Free State litter-free. Keeping our roadways free from litter and debris improves the health of our environment. It enhances the experience of driving in Maryland - for both residents and visitors. Since the Adopt-A-Highway Program started in 1989, MDOT SHA has partnered with more than 120,000 Marylanders who have cleaned over 15,000 miles of roadside. Small businesses and other MDOT SHA approved organizations may participate in this program. Recognition of tourist related facilities is acceptable. Groups agree to adopt a one-mile stretch of highway to clean it at least four times a year. At least one member of the group must be 18 years old or older. Children 12-17 years old may participate with adult supervision. For safety reasons, children under the age of 12 are not allowed to participate in litter pick-up events. MDOT SHA provides your group with training, safety vests, trash bags and tips on how to pick up trash and recyclables. We also place signs recognizing your organization at both ends of the adopted roadside. Note: Signs for businesses selling alcohol, smoking products, and recreational drugs, and those with pornographic messages are not permitted. Signs advocating, promoting, or advancing a cause such as social issues, group action, activism, political agendas or opinion, and those with non-family-friendly messages are not permissible. The Adopt-A-Highway Coordinator in your county will guide you through the process, identify a stretch of highway to adopt, and provide you with safety training materials as well as supplies. 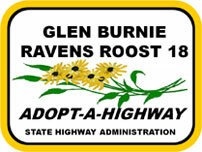 Once an adoptable road is chosen, you will receive a Group Adopt-A-Highway application. MDOT SHA maintains non-tolled numbered routes in Maryland’s counties. Please contact your local public works agency if you wish to adopt a road that is not maintained by MDOT SHA. 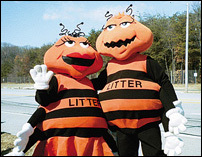 As an additional public service, MDOT SHA offers support for litter awareness events at schools and civic events. The program can provide materials including coloring books, brochures, speakers and visits from our Litter Critter characters. Contact the Adopt-a-Highway Coordinator in your district for further information and scheduling.